Adds the Welkynd Stones known from Oblivion to Morrowind. Reasonably implemented you can find these stones only at one place in the game world: on the corpse of an unlucky adventurer from Cyrodiil. No new quest, just one new item, a scroll and a skeleton. Added "HD Textures" as optional download. 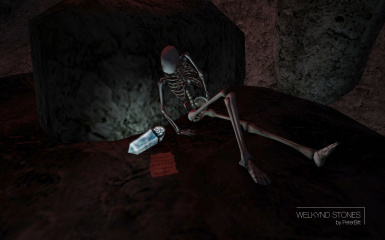 Reasonably implemented you can find these stones only at one place in the game world: on the corpse of an unlucky adventurer from Cyrodiil. 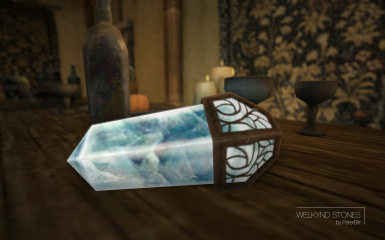 A Welkynd Stone has the same effect like in Skyrim: You can consume it to completely restore your magicka but it will be destroyed in the process. Due to the limited number of Welkynd Stones on Vvardenfell you might not want to use them, but it's still satisfying to find them as they are pretty and rare. The textures and meshes have a quite vanilla-friendly look, the texture-resolution and poly-count fit the original game. The textures use vanilla textures as base with new detail painted by hand. The item has transparency, is glowing and emits light. I attempted to create a nice little backstory with connections to TESIV:Oblivion and references to the Welkynd Stone quest-giver in Oblivion: Lithnilian. The mod is clean, bug-free, proof-read (thanks to Spirithawke) and the simple script works flawlessly (thanks to abot).